A friend of mine recently sent me a request. 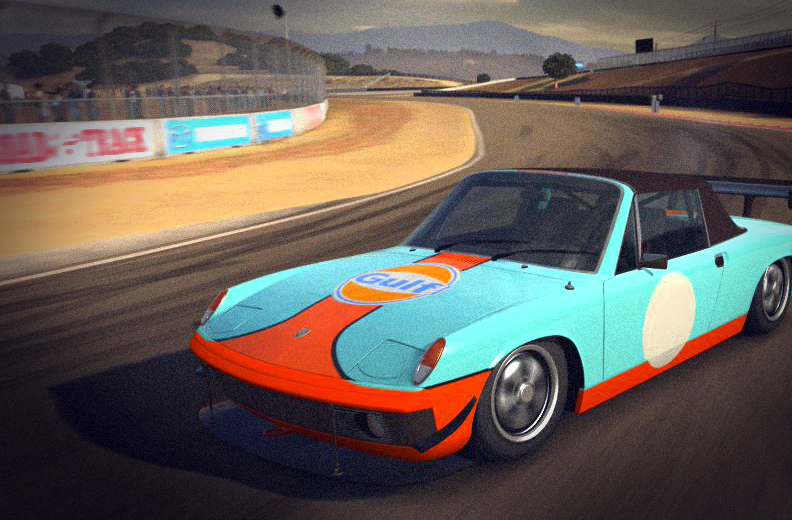 As an auto racing enthusiast, he was curious about what it is was that made the Gulf Racing colors and designs work so well together, especially with the classic 1960s and 1970’s Le Mans cars. I have to say this is one of those things that I never really stopped and thought about. As a designer, I know I should have but I just never did. I think part of the reason I never gave it much thought was, as a child of the ’60s and 70’s I grew up with the mystique of Gulf racing, Steve McQueen, the Ford GT, the Porsche 917, and all the “Cool” that surrounded it. I never really stopped to ask why it worked, it was already cool so there was no need. So today I decided to take a deeper look, and here is my two cents plus a bit of history and theory, for this Design Friday post. I guess when we look at it, we should really start with the overall color scheme. before we dig in though, it needs to be pointed out that the powder blue and orange were not just random choices. Those colors were specified by Grady Davis, Executive V.P. of Gulf when Gulf became the sponsor of the J.W. Automotive team of GT.40s. Davis said the cars had to be powder blue and orange, which were the corporate colors of the Wilshire Oil Company, from California. There is some speculation that Grady wanted the colors to be similar to Gulf’s navy and orange color scheme, but felt powder blue was more exciting. (from ‘The Certain Sound’ by John Wyer, courtesy, Roger Clark) There is a solid reason why the Gulf racing colors are more exciting than the corporate colors. 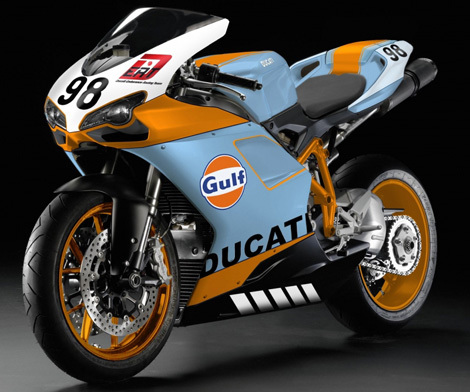 There are a couple of things that are going on with the blue and orange used by the Gulf racing team. While blues and oranges are complimentary on the color wheel, the powder blue is of a lighter value than the orange. Whether or not Gulf intended to this, the color they chose had more optical vibrancy than the darker navy blue used in the corporate logo. 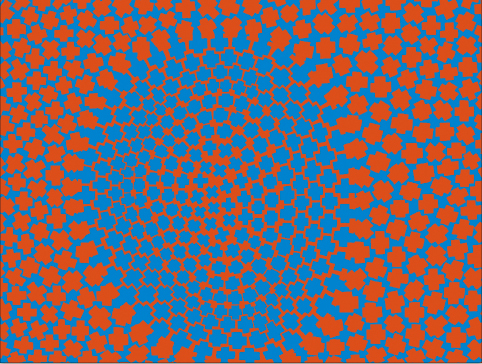 The orange is the same in both, but when you look at the colors compared to each other side by side, the combination of powder blue and orange tends to vibrate. This phenomenon is called “Equiluminant Colors”. When our eyes encounter colors that are Equiluminant, we have a hard time assigning them positions, so the color tends to vibrate or move slightly. A great example of this is Richard Anusziewicz’s painting “Plus Reversed”. Artists use the technique of “equiluminance” to blur outlines and suggest motion. Because of the way our eyes and brains work, humans cannot perceive the edges of objects where object and background have the same luminance. If parts of a painting are equiluminant, their positions become ambiguous. They may seem to shift position or to float. So even though Gulf probably didn’t intend to, they actually created more than color tension. They created a literal optical illusion where the colors seem to float at the point of intersection. At some point, Gulf added a navy blue stripe to separate the main color fields helping to block this natural vibration from occurring. Visually the colors still pop, but optically they vibrate less. 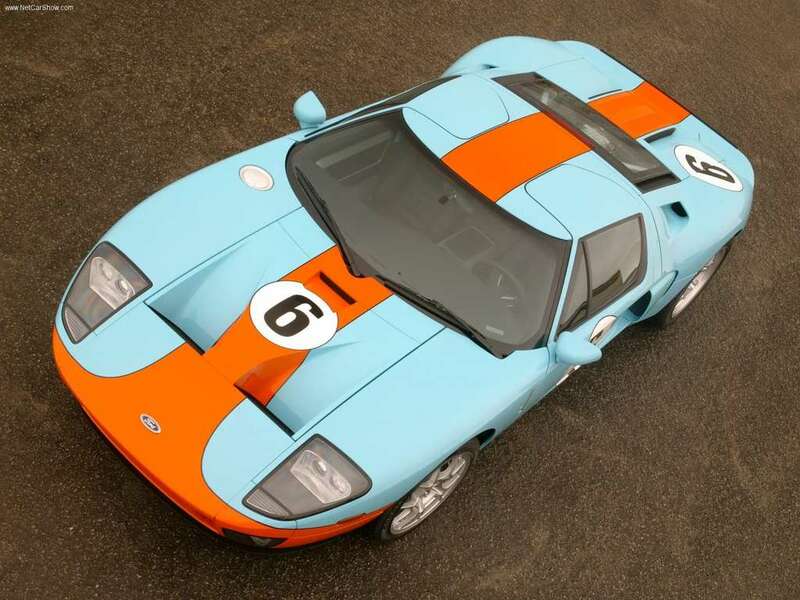 The actual color names for the Gulf Racing Team are 3707 Zenith Blue, and 3957 Tangerine, both developed by Llewellyn Rylands for the Gulf GT40s as pigment dyes that were used in the fiberglass body panels on the cars. Note the navy stripe between the Zenith Blue and Tangerine that helps to visually break the Equiluminant vibration created by the light blue and orange color contrast. As for the graphic design schemes and layouts of the cars, that is a whole lengthy post unto itself, and there is a great book available that details the history of racing card design. The book “Go Faster” from Gestalten, is an absolutely brilliant look into the history of racing graphics and design giving far greater insight than I could ever provide. 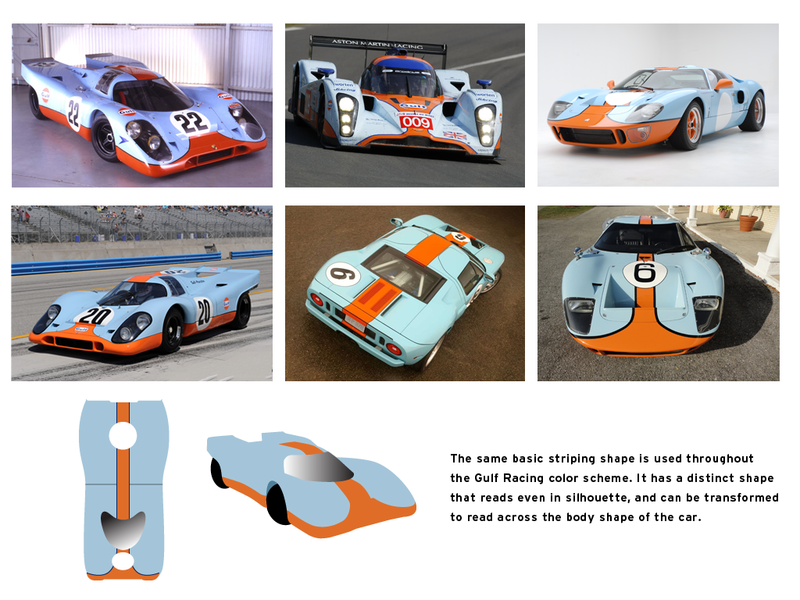 For me, when I think about what is from a design perspective that makes Gulf racing cars work, it is a combination of things; First, there is the intense color pallet which was different from any other at the time it was introduced. Then there are the classic sweeping lines of the Le Mans cars. Long low to the ground, sinuous sweeping arcs that visually scream speed. Then There is a consistent shape that is used across all the cars in the livery. Oh, and that three prong stripe that runs along the bottom edges of the car, gathers at the nose and sweeps back to the rear of the car. The stripe might vary slightly in shape, but it is always recognizable across all of the cars throughout Gulf’s racing heritage starting in the mid 1960’s. 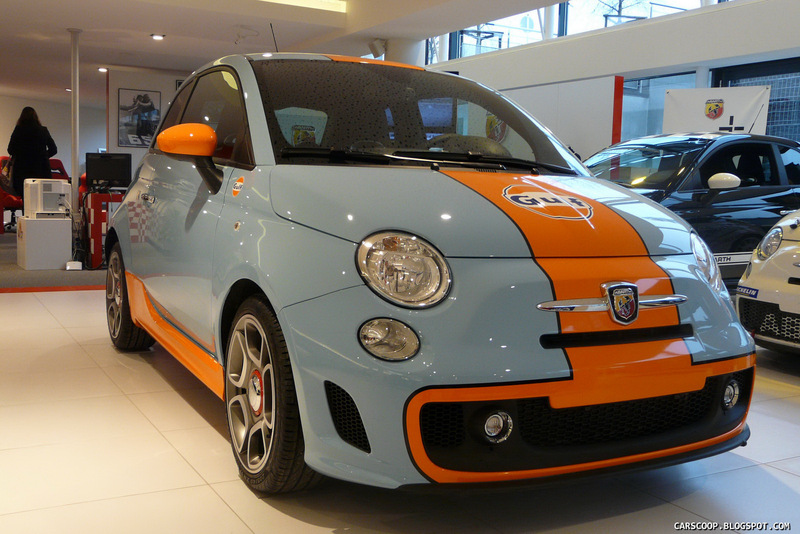 No matter what car this color and graphic scheme is applied to, it always reads Gulf Racing. It is an unmistakable color and design combination even almost 40 years after being introduced. 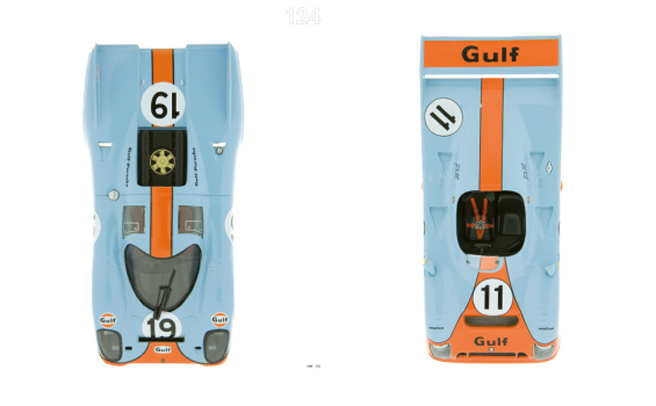 For a great article on Gulf, Steve McQueen, and Le Mans 1970 click here. Lots of great visuals and writing. Posted in Automobiles, Design and Art, Postaday 2011 and tagged 3707 Zenith Blue, 3957 Tangerine, Equiluminant Colors, Ford GT, Gestalten, Go Faster, Grady Davis, Gulf, Gulf Oil, Gulf Racing, J.W. Automotive, John Wyer, Llewellyn Rylands, Plus Reveresed, Porsche 917, postaday 2011, postaday2011, Richard Anusziewicz, Roger Clark, Steve McQueen, The Certain Sound, The Selvedge Yard, Vision and Art: The Biology of Seeing, Wilshire Oil on April 22, 2011 by Author.